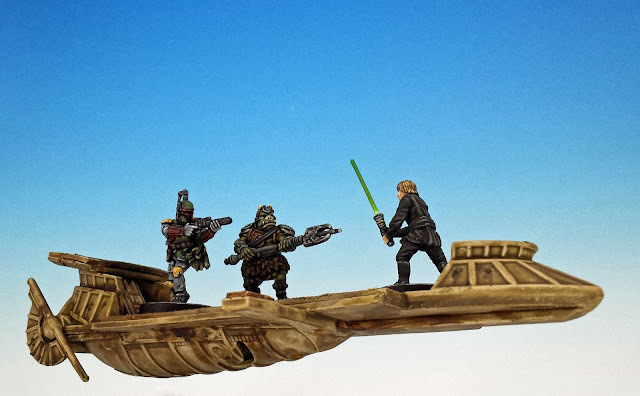 I've gotten some questions about the desert skiff that I used in pictures from my last post on Jabba's Realm, the new expansion for Star Wars Imperial Assault. So I thought I'd quickly post to explain how I kit-bashed this skimmer (also known as the Bantha-II Cargo Skiff) for use in 28mm or 30mm games like Imperial Assault. But first, some grousing... Fantasy Flight Games failed fans with their slapdash approach to scenery (like desert skiffs) in Jabba's Realm. The sequence above the Sarlacc Pit in Return of the Jedi is one of the most exciting action scenes in the Star Wars films. Appropriately, FFG attempted to create game scenarios that involved both the Pit, Jabba's barge and the smaller desert skiffs. But the map tiles meant to represent these locations are miserable. The barge is a bland, generic interior; the Sarlacc Pit is inexplicably cut in half; and there are no skiffs at all (instead, players use featureless interior hallway tiles to mimic the skiffs). None of this makes any sense to me. The joy of Imperial Assault is that you replicate almost anything you want on the tiles... it just takes a bit of cardboard. 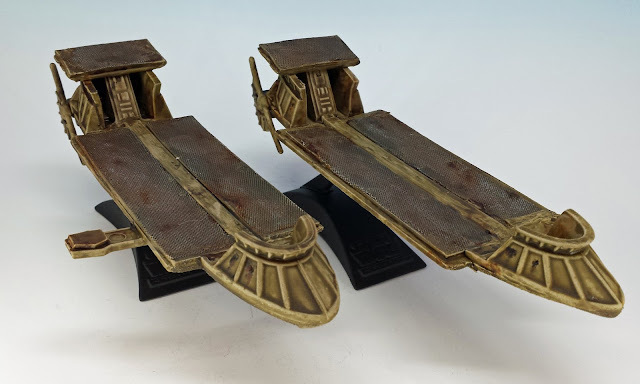 Well, in any case, since FFG cheaped out on giving us desert skiffs, I decided to create my own. 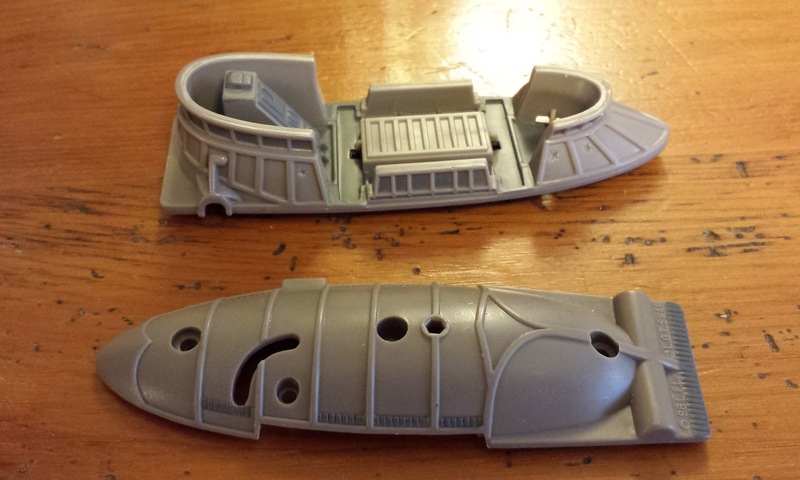 I started by finding a couple old Micro Machine Dune Sea Desert Skiffs on eBay. 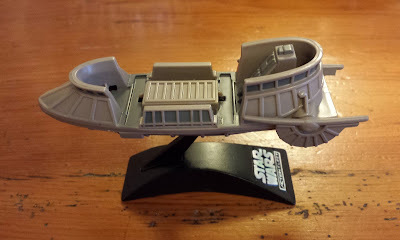 These are nicely detailed models, but much too small to be used as a skiff in Imperial Assault, since the skiffs must have a flat playing space of 5" by 2" (or 5x2 maps squares). 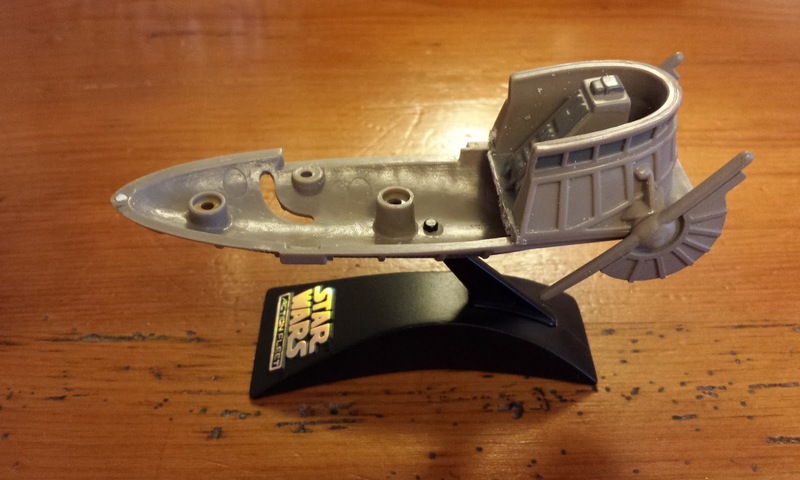 My simple plan was to extend the deck on the Micro Machine while keeping the distinctive features of the skiff itself. Above we see the original skiff. Step 1: Disassemble the skiff by removing the screws. Step 2: Chop up the bow and stern of the top part of the model. Leave the bottom part intact. Step 3: Reassemble the bottom part of the vessel with the stern. 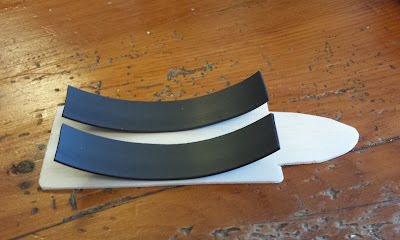 Step 5: Cut out 2 pieces of magnetic tape for the deck (Since I mount all my IA figures on metal washers, the magnetic tape gives them extra stability when the stand on the skimmer). 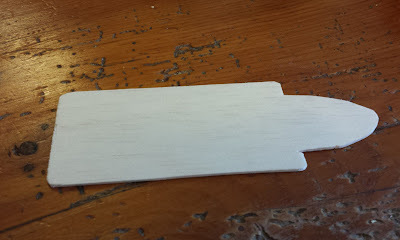 Step 6: Glue the bow to the balsa wood. 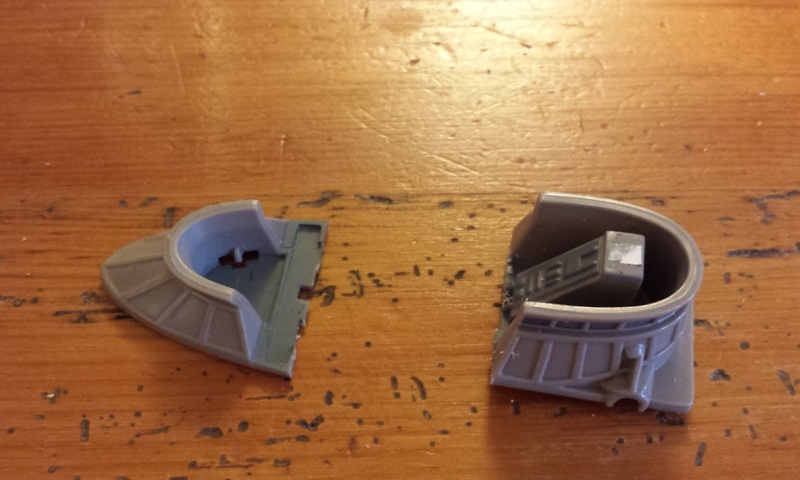 Cover the magnetic tape with model train fence mesh. Glue a stiff length of wood in the middle of the deck (between the two pieces of magnetic tape) in order to give strength to the construction. 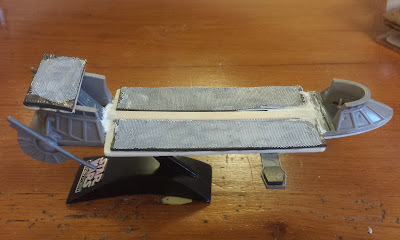 I also glued a support strut to the bottom of the deck. Step 7: Glue the deck to the bottom/stern of the model. Glue the small rear deck to the top of the stern. Fill in gaps with putty. Sand rough edges. (Not shown: I also glued some metal ball-bearings to the inside of the base to give the whole model more stability). Painting was fast and dirty. The main body of the skiff was painted khaki and roughly dry-brushed. The mesh was painted black and dry-brushed with gunmetal. Then I applied a coat of Army Painter Quickshade Strong Tone. Rust and oil effects were then added with oil paint and white spirit. And then, of course, a varnish with Dullcote. Now we're ready for the Pit of Carkoon! Very well done "how to". The end product looks great. Oh my! I couldn't imagine all this behind!! It's enormously cool! I didn't know of the scenery 'problem' in the game, but you solved it out in the most classy way. Slow clapping!! Brilliant work. I especially like the skiff which includes Luke's diving board. Nicely done. I feel like a less industrious hobbyist could produce a tolerable 3d result using just card, if needed, but this is bang on. Odd that this game neglects the scenery/terrain, given the awesome figures they produce. 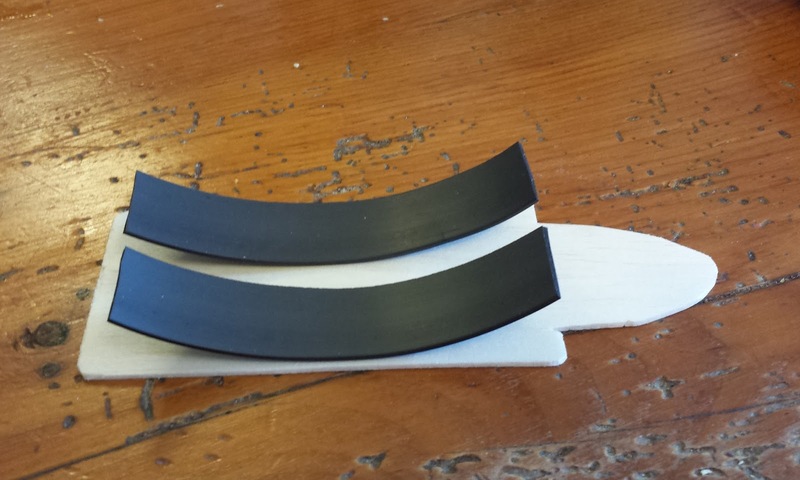 There are some nifty pdf skiffs that you can print at home and then assemble into a 3d model. I thought about just doing that... if I find the link again, I'll post it on my site. Great walkthrough. The mesh is an interesting idea. I take it that its finer than the aluminum mesh you buy in the craft store. I got my mesh at a model train store. 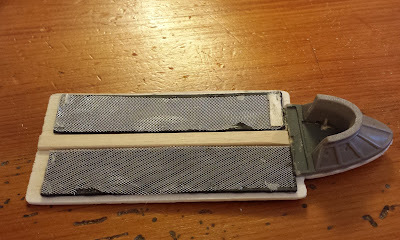 I'm not sure about what you find in a craft store (I haven't seen any mesh at my local shop) but the stuff I used is very fine and fragile (although the accidental tears seem to add to the effect when doing a worn out vehicle like these skiffs). Those skiffs are genius mate! They'd work equally well in my recent (And by "recent" I of course mean last year... sometime.) 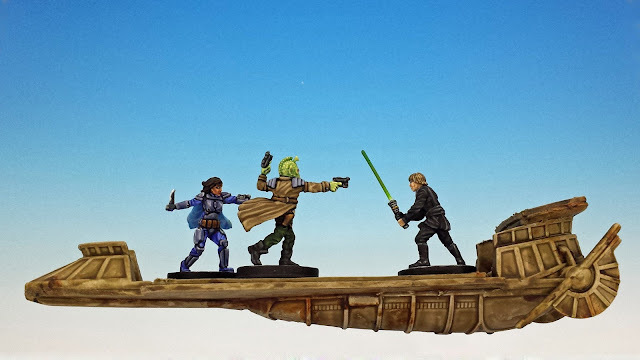 FFG SW rpg games. 3D scenic stuff is so much cooler and adds far more to any game. Hat tipped your direction for inventiveness.